Yes, rats - in the rabbit feeders. I went into the barn a couple weeks ago and found rat droppings in the feeders. Not only was I not happy, I was very annoyed at my barn cats for apparently sleeping on the job! Below: See the rat on top of the cage, top right in the picture? I immediately purchased a trail cam so I could spy on the little thief or thieves during the night. It took days of surveillance before I finally witnessed what was happening: a rat was running along the top tier of my metal rabbit hutch frames. 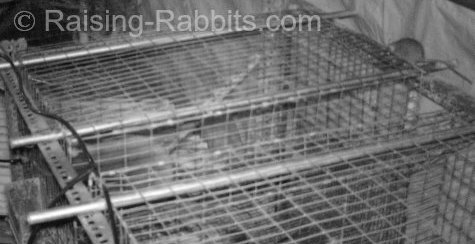 It was able to squeeze into the 1"x2" cage wire from the back, running past a mostly unfazed rabbit to scarf down the rabbit pellets. The bottom cages seem to be rat-free, possibly because of the drop pans resting on the top of the bottom tier cages. But then why is the rat not entering the bottom tiers from the front of the cages where the drop pans are 12 inches above the cages? Could it be due to the presence of the cats which lurk in the center aisle of the rabbit barn? I don't yet know. I cannot allow the rats to get into the cages! Their droppings almost certainly contain pathogens. Additionally, if rats can get into the cages, then they will also get into the rabbit nest boxes and help themselves to the tiny newborn kits. Being as this problem is a first for me, I am learning as I go. Have you ever had problems with rats in your cages?? If yes, please go to the Raising-Rabbits facebook page and let us (and the rabbit community) know how you solved the problem! In the meantime, I’ve covered the tops of the upper cages with empty feed sacks. So far so good, though since the cage tops aren’t completely covered, I rather expect the rats to wise up eventually. I will also obtain some live traps as well as some homemade affairs that should prove more lethal - involving large tanks of water and bait suspended just out of reach. I don’t plan to use poison. I’d hate for my cats or chickens to eat a poisoned rat and then themselves to die. I’ll provide updates either here or on the Raising-Rabbits facebook page. In the meantime, please offer your tips! There's a new page on the Raising-Rabbits website! Our Facts about Rabbits page offers detailed info on EIGHT pet rabbit facts. These in turn are based either on scientific inquiry or extensive experience. For example, should you get your child a big rabbit or a little one? The second fact about rabbits answers this question. 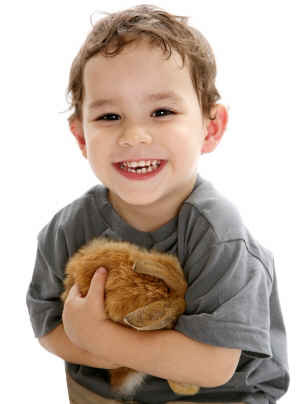 2 - The best rabbit for a child has more to do with a gentle personality and less to do with size. How safe is a rabbit if the kid can pick up only half of it? Before you know it, the rabbit’s back is broken, and the child has deep scratches. If a child receives a small rabbit, the reasoning continues, the child could more easily manhandle it, possibly killing it accidentally. According to this train of thought, a broken back is preferable to sudden death. Actually, the choice of what size or breed of pet rabbit to obtain depends purely on yours or the child's preference; you can safeguard the rabbit and the child through supervision for as long as necessary. Larger rabbits do tend to be more laid back, though plenty of smaller rabbits are gentle enough for a child. Getting a gentle rabbit, along with supervision at the outset of pet ownership (and keeping the rabbit's claws trimmed!) will help avert accidental injury to the new pet rabbit or to the child, and will ensure the child can be trusted to play comfortably with the rabbit. Some house rabbits fare better with a rabbit friend. And some don't. Rabbit introductions should be done carefully, since rabbits carry their natural societal instincts into pethood. Rabbits need to gnaw on stuff in order to keep their teeth worn down. Well-socialized rabbits are likely to happily tolerate handling. Rabbits are trainable to a significant degree. One year in a rabbit's life equals something like 9 human-years. By now, if you aren’t completely snowed under, you may be noticing an influx of deer or rabbits into your yard or garden. Both of these species survive the cold winters by gnawing on bark, since their entire menu is dead and buried under a blanket of snow and ice. This Springville Journal article has some great tips on discouraging their visits, even training them to stay away. Your friends at Raising-Rabbits.com wish you a wonderful March 2014.